DOWNTOWN BROOKLYN -- The national anthem singer at the Brooklyn Nets' home opener took a knee at the end of her performance. Justine Skye was nearing the completion of the song Friday night when she went to one knee for the finish. There were some cheers, but appeared to be more boos from the crowd at Barclays Center to see the Nets play the Orlando Magic. Skye, who is black, is a recording artist from Brooklyn for Roc Nation. Rapper Jay-Z, the agency's founder, was a part-owner of the Nets when they moved to Brooklyn five years ago. Players from both teams stood along the foul lines during her performance, as NBA players have continued to do. Unlike the NFL, where some players have followed Colin Kaepernick's lead and taken a knee during the anthem, the NBA has a rule requiring players to stand. 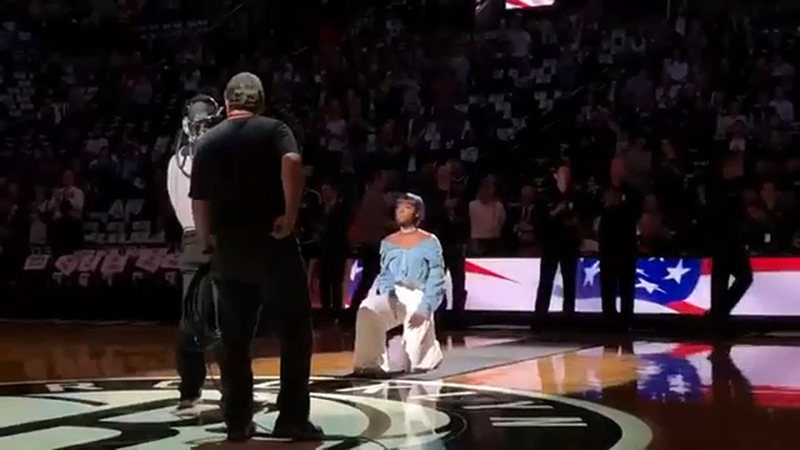 "We recognize that tonight's national anthem singer kneeled briefly at the end of her performance and we were not aware that she was going to do so," a Nets spokeswoman said. Skye isn't the first anthem singer to make a statement during a performance. Last December in Philadelphia, Sevyn Streeter performed the anthem wearing a "We Matter" jersey before the 76ers' game against the Los Angeles Lakers. The R&B artist had been scheduled to sing earlier before the 76ers' home opener, but was scratched by the team two minutes before the performance because she was wearing a "We Matter" T-shirt. Following backlash from players and other members of the organization, the 76ers apologized to Streeter two days later and invited her to sing at a future game.